Background: Systemic Lupus Erythematosus (SLE) involves genetic, environmental, and hormonal alterations, including Vitamin D deficiency. Objective: To evaluate the association between vitamin D levels with anti-dsDNA, complement proteins, immunoglobulins levels and disease activity scores. Methods: A cross-sectional study was performed. The levels of 25-OH vitamin D were measured in patients older than 18 years with SLE according to ACR/97 [American College of Rheumatology 1997] from 2013 to 2015. The association was assessed by Mann-Whitney U and Kruskal Wallis tests for continuous variables, and by the Chi or Fisher exact test for the nominal variables. Results: Sixty-nine patients were included; 82% were women; the mean age was 38.5 years; 36.2% had low levels of vitamin D with higher consumption [p=0.006] of C4 and C3 complement proteins, plus higher levels of anti-dsDNA. 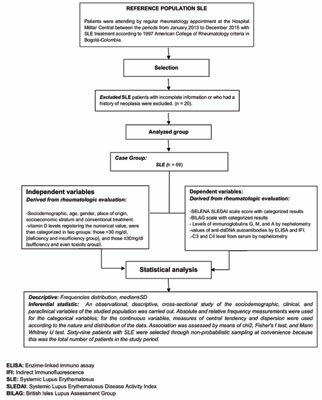 Lower values of vitamin D were observed in patients with moderate to severe activity [p=0.0001] by SLEDAI [Systemic Lupus Erythematosus Activity Index] and general domain [p=0.039] and renal domain [p=0.009] by BILAG [British Isles Lupus Assessment Group] 2004. The mean vitamin D levels were higher in the group not receiving steroids when compared to those groups with dosages of 0.5-1mg/kg/d [p=0.048]. Conclusion: Lower levels of vitamin D are associated with greater complement protein consumption and higher disease activity rates. Therefore, it is important to evaluate vitamin D supplementation in patients with SLE as part of the treatment, especially when it includes the use of steroids. Vitamin D, SLE, outcomes assessment, C3 complement, lupus nephritis, colombian patients.